For the end of the week(Thursday, Friday, Saturday), we take reservations only 1 week in advance. ...unfortunately there can be NO GUARANTEE Of AN AVAILABLE ROOM then. B.- For reservations which are made longer than 2 months in advance there is a minimum stay of 5 nights in general. C.- In general, we accept reservations only up to 4 months prior to the arrival day. Sometimes, however, we make an exception under the condition of pre-payment, no change of the reservation, and no refund, if the room cannot be rented out. We recommend to take out travel insurance. D.- Because we are a very small, individual hotel with highly personalized and rather sophisticated rooms, unfortunately NO reservations from any GROUPS (more than 4 people) can be accepted. E. CANCELLATION POLICY: PLEASE ALWAYS ASK BEFORE YOU RESERVE! a) In case of a CANCELLATION IN TIME we will not charge you. b)Cancellations after the cancellation limit ARE NOT POSSIBLE.In this case,we reserve the right to charge the whole amount, if and when the room cannot be rented out on the same conditions. Because of the rapidly changing booking habits in these modern times, unfortunately, we now only can provide a very limited time frame for cancellations. c) Any CHANGE of the reservation after the day of the cancellation limit, unfortunately, is also NOT POSSIBLE. Because we DELIBERATELY do not work with any booking sites and travel agencies whatsoever, therefore UNFORTUNATELY WE NEED THIS VERY STRICT CANCELLATION POLICY, and therefore cannot make any exceptions - REGARDLESS the reason of the cancellation (personal & family & weather conditions,flight cancellations,etc.). Kindly keep in mind:This is a small and very individual, privately owned, hotel (with owners who are working as hard as you do)and not one of those anonymous big chain hotels of the so-called "travel industry": PLEASE DO NOT RESERVE if you do not like to accept our conditions - to prevent any MUTUAL disappointment. We strongly recommend you to TAKE OUT TRAVEL INSURANCE!!!!!! This is an easy and inexpensive way to avoid any inconvenience in case of an emergency!PLEASE, do not take any risk!! A.- PLEASE,NEVER send CREDIT CARD DETAILS by normal e-mail - ONLY BY TELEPHONE, FAX or secured booking form. We cannot guarantee the safty of personal data which are sent by ordinary e-mail. Experts say:It is as if you were sending your credit card details by post card. There is HIGH DANGER of Trojan Horses,etc.,etc. E.g., see a report - as early (!!!) as December 2008 - in The New York Times by John Markoff: " BE AFRAID. NO, REALLY - Cybercriminals Are Winning The Internet War...credit card thefts,bank fraud and other scams rob computer users of an estimated $ 100 billion a year,according to a CONSERVATIVE ESTIMATE...As many as 10 million computers are infected by MALICIOUS SOFTWARE...". Is it really necessary to risk your precious money ( ...in these critical times of financial insecurity and economic uncertainty) - with no chance to gain anything - only because it is convenient ? If you have any difficulties to reach us by phone to provide your credit card details or for any questions,please send your telephone number and WE will CALL YOU. Please note: We promise to handle your personal data with all possible care, nonetheless, there is DEFINITELY no ultimate security in these modern times - as we come to know DAY BY DAY...therefore WE CANNOT ACCEPT ANY LIABILITY! By the way,since July 1 2008 a comprehensive national smoking ban is in effect for all hotels and restaurants in The Netherlands. D. - All rooms have AIR CONDITIONING. E.- We regret: Unfortunately this historical canal house is NOT suitable for families with babies or children under 14. F. - All rooms have FREE WIRELESS HIGHSPEED INTERNET access. Did you forget your LAP TOP? No problem. We lend you one -FREE OF CHARGE-to take to your room, for 1 or 2 hours (unfortunately not during the entire day...because other guests might ask also for one, and we do not have an extra computer for all of our rooms. )Please note: The use of our computers is on your own responsibility. G.- Local telephone calls are free. NEEDLESS to say: If you are paying up to € 210.- per night - in all modesty! - you may expect a hair dryer in your room - without the terrible necessity to write an extra e-mail. . .It goes without saying, we also provide an iron and iron bord, on request. YOU know much better than the best travel agent in the world what you personally like. AND, first and foremost:this - indeed very exclusive policy - helps us (mostly...) to AVOID the well known problems and misunderstandings of impersonal & anonymous internet bookings. By the way, there is more in life than to amass a maximum of money, although this seems to be the very poor philosophy and signature of our brave new century... We are sorry,if our - unfortunately necessary - policy might be a little inconvenient for you. Therefore, our rooms can be reserved EXCLUSIVELY PERSONALLY...not even by your secretary! To guarantee AN OPTIMUM OF SATISFACTION we offer quite AN UNIQUE SERVIVE to the individual,sophisticated and discriminating traveller. (PLEASE, kindly KEEP IN MIND:Some photos are made with a wide angle lens,to enable you to see the totality of the room - not just a nice detail...lt goes without saying that the - by the way well-sized - rooms appear to be larger than they in reality can be. Unfortunately, this is an absolutely unavoidable - but well-known! - technical question.). Would you be so kind as to CHOOSE and decide - IN LEISURE - which rooms (if any...) are most IN ACCORDANCE WITH YOUR WISHES AND PREFERENCES? YOUR PERSONAL CHOICE IS ALL IMPORTANT: It's YOU who will be staying with us ... most probably not your secretary. PLEASE NEVER choose a room which is not your first choice (e.g.because it might be the only available one).In this case, we very much prefer you to CHOOSE ANOTHER HOTEL , and we also reserve the right not to accept such a reservation to prevent a MUTUAL disappointment. We very much like you to FULLY ENJOY YOUR STAY with us (...and not only so,so! ).That's an essential part of OUR SATISFACTION. "LIFE IS SWEET AT SEVEN BRIDGES"
as one of our very appreciated American guests (who stayed with us twice a fortnight) named it so poetically. rooms with a view at the lovely gardens. Your eyes will be absolutely pleased what you get to see at daytime,your ears might have some doubts at night...especially if you are fighting against the jet lag. Although the hotel is on a quiet street,you can't sleep with open windows (as in no big city) - certainly not on hot weekends in the summer. THE SECRET of the secrets is: We provide THE great OPPORTUNITY for such a choice. THANKS to the extra-ordinary FRIENDLINESS and GREAT LOYALITY of our very appreciated guests ,we are in the happy position to be able to offer such a service. ...If there are any open questions or if there is any uncertainty, PLEASE, ALWAYS ASK. ...If anything is not the way you might have expected it,PLEASE,let us know this IMMEDIATELY (PLEASE, not only after a year or so...in public!) ,that will GIVE US THE FAIR CHANCE to find a way to guarantee your full satisfaction,as soon as possible. IT IS THE ANTIDOTE TO A BLAND MODERN CORPORATE HOTEL. There are no public rooms, besides a small lobby (But our guest house is much more than a usual B&B). ...You may expect (as said):Air Conditioning,free high speed wireless internet connection,a labtop,which you can take to your room for an hour or two. 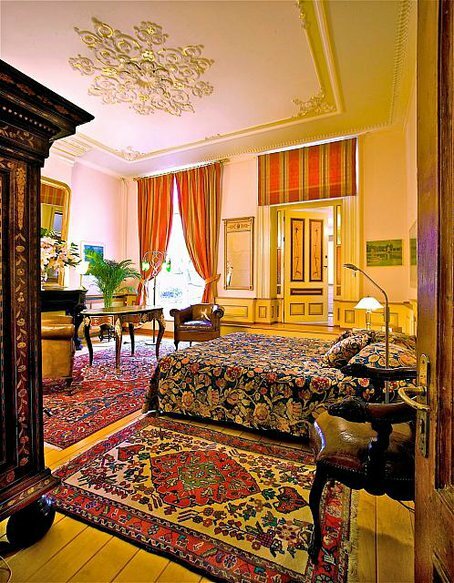 The hotel is set in a charming but very small HISTORIC MONUMENT from about 1720. That sadly but inevitably implies: A VERY STEEP AND NARROW STAIRCASE and of course NO ELEVATOR ! THEREFORE THE HOTEL IS NOT SUITABLE FOR DISABLED PEOPLE OR ELDERLY GUESTS. There is - UNFORTUNATELY - not always someone present who can help you with your luggage . ...If you cannot CARRY YOUR HEAVY AND HUGE SUITCASES BY YOURSELF, PLEASE do not reserve a room on the upper floors, but rather CHOOSE ANOTHER HOTEL in a more modern building. - as another one of our happy guests named it so appropriately - but we would not like you to ruin your precious health... or ours!